The coalition government led by the Democrat Party has secured its hold on power after winning the majority of the seats in Sunday's by-elections. According to unofficial results, the Democrats have won 20 of the 29 seats available, leaving only 9 seats for the opposition parties. 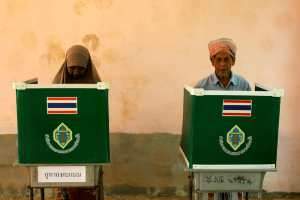 In a separate race for the governorship of Bangkok also held on Sunday, the candidate from the Democrats sailed through, receiving a resounding 45 percent of the votes cast. Political analysts are hopeful the Democrats' victory will bring the much-needed stability back to Thailand's politics.